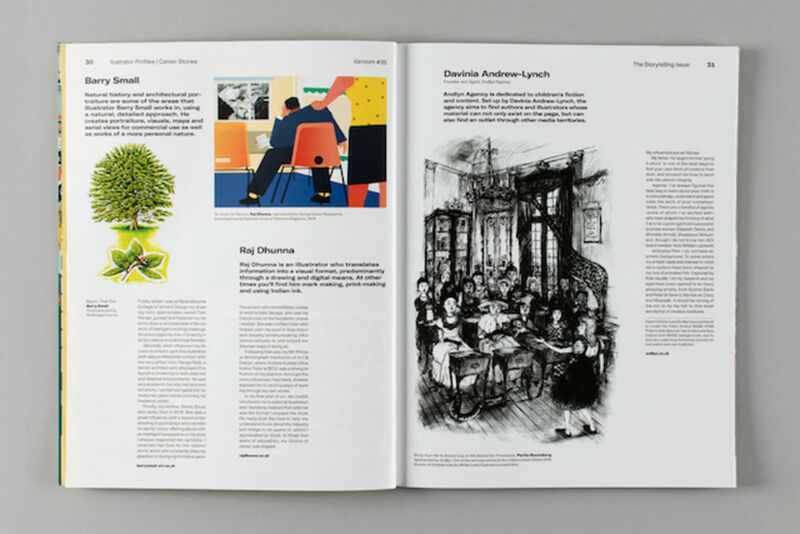 “Varoom had been well received in its previous incarnation as a large format newsprint publication, but as it has been like that for several years. We wanted to refresh the design, particularly to focus on the different elements of the content. 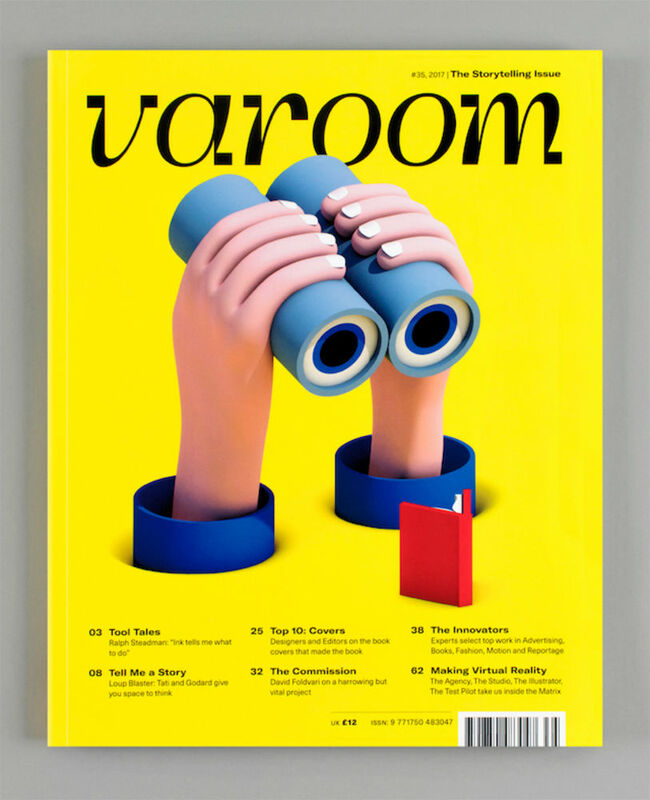 We want readers to be very clear as to what they are reading about, and to be aware that Varoom covers illustration in all its many contexts. Each issue is themed, and as well as articles there are regular industry experts who introduce innovative work in their fields. The new design makes their areas of Advertising, Children’s Books, Public Realm etc. more explicit so readers are immediately aware of what they are looking at. James Lunn: The project came about through John O’Reilly, Varoom’s editor. I had previously discussed a magazine design with him a few months previously—unfortunately it went in another direction that time. So I think he had me in mind as we had wanted to work together on something since then. Just before the Association of Illustrators invited us to present a proposal for the Varoom redesign, I was given the opportunity by Sagmeister & Walsh to work in New York. I decided that should we get the job for the Varoom redesign, it would be best handled by two designers: one in London and myself in New York. I called up Joe, as we had worked together on a number of other projects—we are close friends as well, so I knew that it would work out well. We knew going in that it was going to be a challenge to work in two different time-zones, but we were organised and managed to make it work. 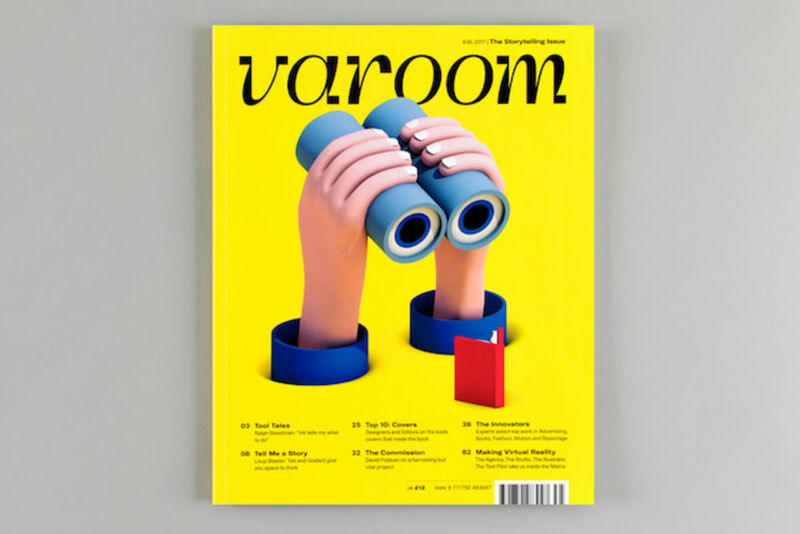 The brief was to create a new format and design for Varoom that would move away from the newspaper and entice a readership outside of the AoI membership, that of designers and readers within a larger creative field, not just illustrators. 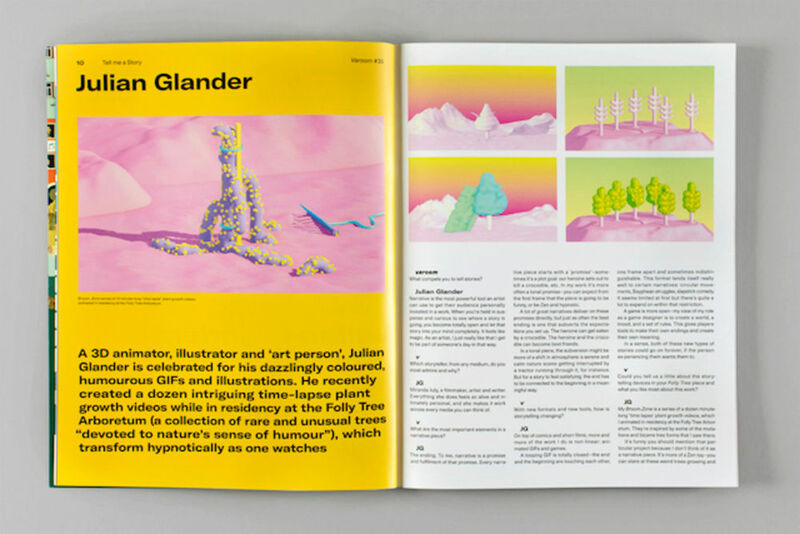 Where do you start when re-designing a magazine? What are the biggest challenges to tackle? James Lunn: The biggest challenges, in my opinion, are trying to retain the simplicity of a new design and creating a system that can be flexible enough to handle longer articles and not feel too overwhelming. Likewise, making shorter texts and articles feel at home on a page. You have to act as a picture editor and text editor to help retain a sense of pace, as the reader moves through the magazine. 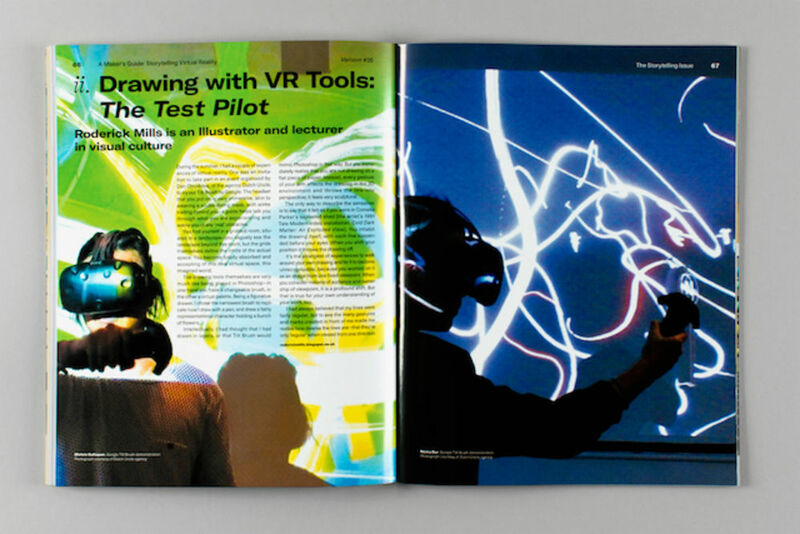 It’s not just a linear experience; a magazine has to work backwards and forwards. Another challenge is trying to balance the budget, which means refining your paper choices and limiting your binding options. Identifying the ‘must haves’ and the ‘like to haves’ is important. It’s not just a case of throwing loads of finishes at the project so that it looks shiny and nice—that can sometimes come across as overkill. You want the final product to feel like it’s a considered piece and each special finish has a reason for being there. 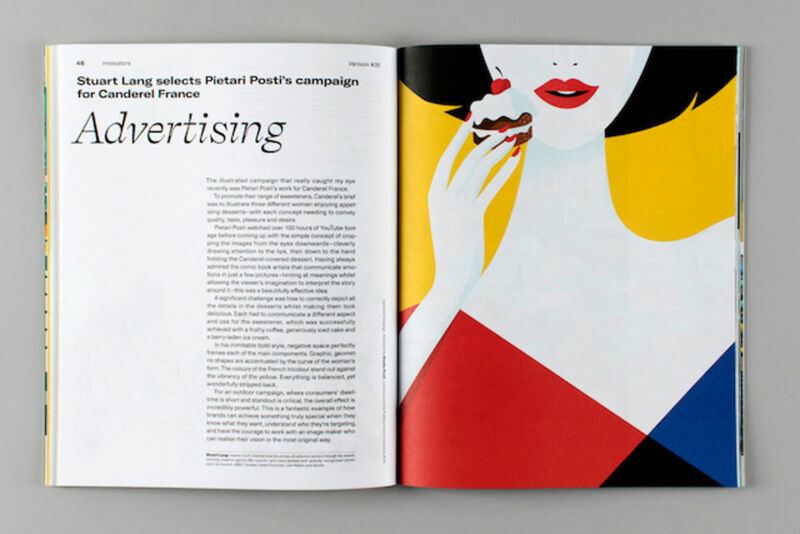 A magazine redesign will often begin with what wasn't working in the previous issues. The most obvious aspect this time was the newspaper format, so that was changed straight away. Then you look at what wasn't working with the design, and then the content. Its important to update the writing styles and type of content as much as it is important to change the visual look and feel of the product. We started by bringing together references from things that we liked and sharing them with each other—mainly the typeface selection, and we built it out from there. Which typefaces are used in the redesign, and why did you choose these in particular? Joe Hales: For the body copy, we were looking for something fairly neutral with a view to creating an enjoyable reading experience. The typeface needed to be flexible and have enough personality to make it feel considered in relation to the magazine’s content. The name Varoom and its identity (within the field of illustration) felt to us to have been developed in the spirit of modernism, and we didn’t want to lose these past incarnations entirely (by Non-Format and Studio Fernando Gutierrez). For the heavy work, we chose Monotype's revival Neue Haas Unica by Toshi Omagari, and applied a grid with a nod to the International Typographic Style. 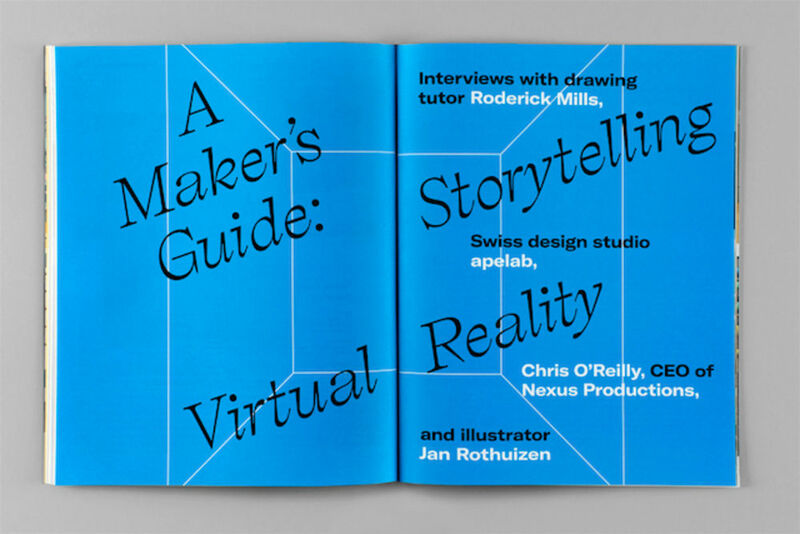 A further consideration was that the magazine needed to be adaptable beyond print; should a new website be needed, or a digital edition, this typeface can handle the transition. We used Self Modern by French typographer Lucas Bihan for headlines and section openers: a slightly off-kilter, stylised serif. This contemporary typeface was chosen to contrast with the more austere body copy, as it is full of character and it balances well at an enlarged size with the body of the text and the larger opening paragraphs. This is also a special font to use, as it's not affiliated with a large foundry—it's not ubiquitous and it's distributed directly by Lucas from his website. Self Modern has the mark of his hand, that of a single creative, and we very much wanted to celebrate graphic design creatives in the design of the magazine, in the same way that Varoom does for those in illustration. The opening paragraphs are set in GT America. The point size here is larger than the body text and the colour is much darker–designed to grab attention, pique interest and give you a taste for the article you're about to read—almost like the way a blurb on the back of a book would. It's a strong, grotesque-inspired typeface with a subtle reference to the grotesque style used in the headlines in the previous design of Varoom by studio Fernando Gutierrez. This is the link that makes the design still feel familiar–the redesign shifts away from its previous lives, so it needed some continuity in detail to bridge the disconnect between the two designs. The new masthead is designed by Kia Tasbihgou—can you tell us about the design process for this particular part of the project? Joe Hales: I first met Kia in 2014 whilst teaching on the BA Graphic Design course at Kingston University. I entered a third year crit to see Kia and fellow student Oliver Long presenting an exciting project they'd collaborated on: the beginnings of a typeface called 'Naraka'. It was a thoughtful and elegant revival of two lost typefaces, Halbfette Steinschrift and Grotteschi Larghi Inglesi, found in the archives of St. Bride Library, which they had reimagined into an exciting new typeface (later completed and renamed Vitæ). They melded elements of each of these two lost typefaces into something that felt completely fresh, whilst retaining the history and sense of what had once existed. This first encounter had stayed with me, and I have followed their work since they both graduated. The design of the masthead was vital to set the tone of the magazine–it was one of the most important elements that we needed to get right and perfect from the start. 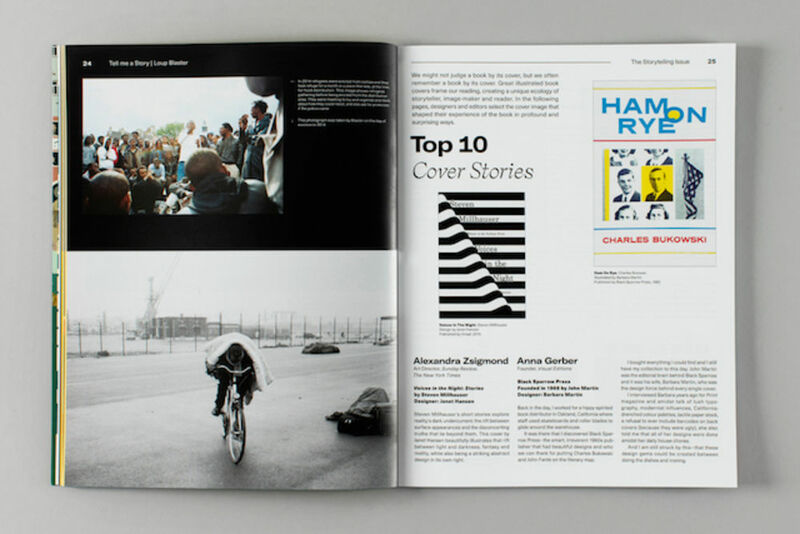 As the hallmark of the magazine’s quality, it’s style and substance, it also needed to make an immediate connection with the readership of the magazine. Coincidentally, at the same time as starting to imagine how Varoom would look, I was also attending a lecture series: Words on Buildings, organised by The Twentieth Century Society. James and I had been sketching ideas for the masthead, experimenting with some success, but we soon realised that to make this truly special we needed to work with a specialist in type design; someone who could skilfully interpret and craft our thought processes. Catherine Dixon's lecture 'Nicolete Gray and the Central Lettering Record' was a lightbulb moment: I was looking at these wonderful uses of Egyptian slab serifs (mostly on facades of buildings), and the strength and structure of the slabs resonated with my intuition for the masthead design. Nicolete Gray was seeing these slab serifs as objects, architectural forms, substantial in their own right, contradicting the tradition of Trajan on buildings. It was then that I understood how this approach could work for our masthead. I contacted Kia with a mood board and a very loose brief explaining that we wanted him to design a masthead that was contemporary, unique, interesting and inspired by Egyptian slab serifs. Kia showed me Montezuma by Samoan lettering artist Joseph Churchward and I immediately realised he understood the brief. Kia set to work–there were a few iterations with minor amends to help with legibility and colour/contrast, but Kia's lettering was almost instantly exactly what I had imagined. Why did you decide to commission Jack Sachs for the cover illustration, and what was the brief that you gave him? James Lunn: The Association of Illustrators supplied us with a shortlist of illustrators for this commission for us to choose from. We feel that Jack’s work is very current and has a playful mix of computer generated imagery and fun naivety; there’s humour in his work we felt suited the issue. We also wanted to see something that enhanced the new masthead. Our brief for Jack was pretty simple and open: we asked him to interpret the issue’s theme of storytelling and then went from there. He provided us with about four sketches and we picked the one that we felt worked best—incidentally, it was the one that made Joe and I laugh first. Can you explain the rationale behind the layout, feature openers and colour choices throughout the magazine? Joe Hales: With the type choices and grid already in place, the structure was set: the openers gave us a chance to control and adjust the pace whilst also being playful with the design. An important consideration was to give the reader breaks, palate-cleansers between courses to give pause and prepare for what’s next, but also to stop the reader in their tracks when flicking through the magazine, breaking the repetitive nature of an article lead format. 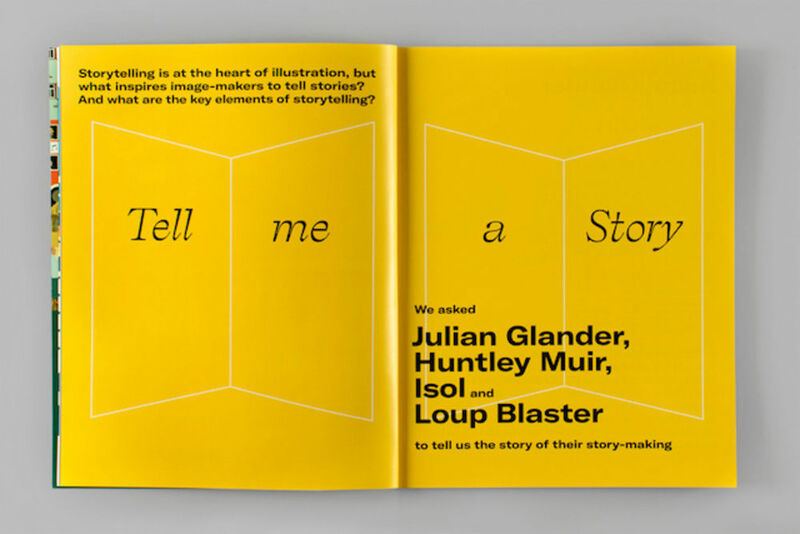 There was a rationale for the openers that worked throughout the magazine, and we followed a few rules such as using the headline typeface larger and at an angle, taking it off the horizontal axis and suggesting the theme of the features with simple abstract, geometric hairline drawings. 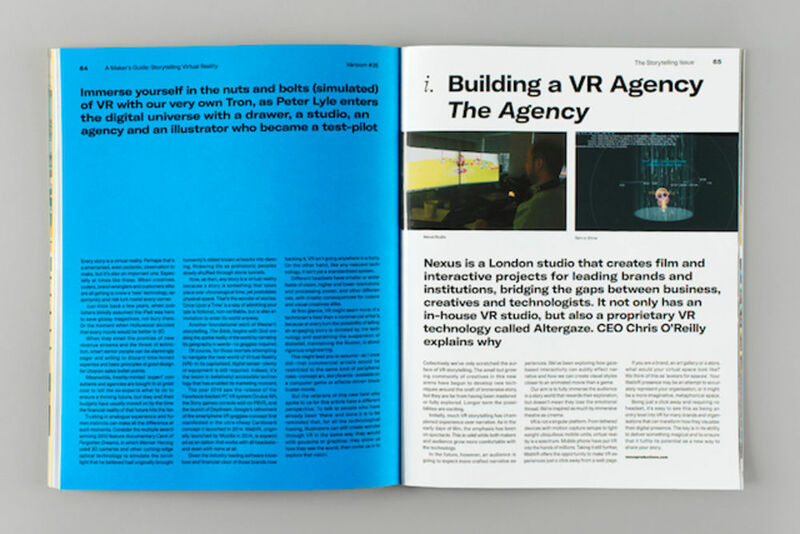 For example, the storytelling section uses the outline of a succession of books to suggest ongoing narrative, whilst the VR opener uses the outline of a notional room set behind the text to suggest the layering effect of being immersed in the other 3D world of a VR headset. Colour was a challenge as it needed to be strong, without feeling out of place or overly dominant. We were restricted to CMYK, in some sense making the choice easier, but on the other hand the lack of a Pantone colour was limiting, and so our concern was to make the colour selection carefully, and not in any arbitrary way (which is all too easy when faced with large spreads full of colour). A few things simplified the decision making of choosing colours for feature openers: did it sit well with the subsequent image pages, was there a connection between the openers and features? Would text, black overprinted or knocked out in white, sit well and be clear and legible? We finally reduced our palette to around 10 colours, and using this selection all the colour choices were made as a committee, with input and conversation happening between the designers, editor and publisher. How do you think the design will develop in future issues of Varoom? James Lunn: Hopefully each issue will grow with more content. So more pages would be great. It would be good to get a bit more space in there, it’s quite a tightly packed issue with loads of good articles. It will be interesting to see what comes up next time, to see if we have created a system that is durable, and that works for more than one issue. We are not restrained by a colour palette, so it will be good to see what is commissioned for the next cover and how that will influence the mood of the issue. What do you think a magazine needs to do to stand out in today's market? James Lunn: It needs to be different somehow from the others, but not so different that it’s hard to get a handle on what it’s about. There are so many magazines at the moment that just look the same, and so to me they are not interesting. It’s important to be trying new things to challenge a potential reader. You need to have some elements in there that can stop someone in their tracks as they are flicking through. You need to convince them to invest in your magazine and to give them enough back so it’s worth their time and money. Don't exclude your audience by trying to be obscure and ‘edgy’. 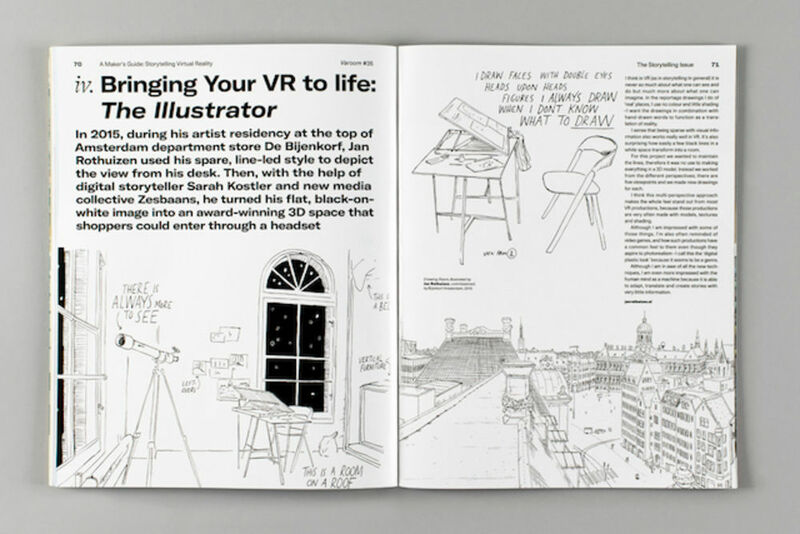 Varoom 35: Storytelling is in the shops now—you can purchase a copy here. Photography of Varoom 35 by George Newton.